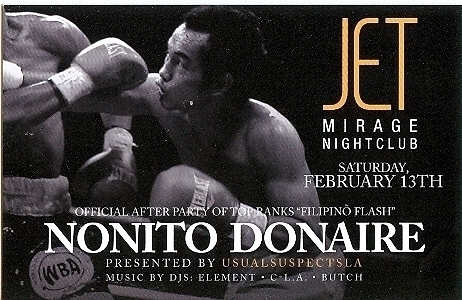 This is a Boxing Promo Card announcing Nonito Donaire's After Party Celebration at Jet Nightclub, inside the Mirage Hotel Casino, Las Vegas, Nevada, on Saturday, February 13th, 2010. Dimensions: 2 3/4 in. by 4 1/4 in. Back is the same. Condition: MINT Buyer pays 1.00 shipping to anywhere in the USA. International rates apply. Send email if you need additional details. Please check this store for more Boxing Collectibles! Thank you for stopping by!